Egg Bagel Sandwichs are great for grab and go breakfasts or fast dinners. This meal-prep recipe is so simple even the kids can help assemble them! 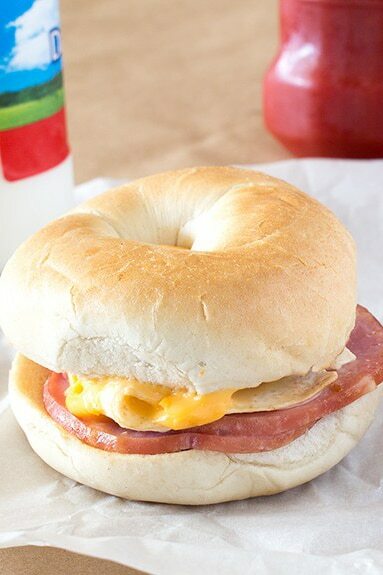 Toasted bagels with Canadian bacon, egg, and cheese is perfect as a make-ahead quick breakfast or dinner. Just reheat in the microwave and have a meal in under a minute. Egg Bagels with Canadian bacon and cheese makes frequent appearances for dinner on the nights we need something quick. I started making these because before McDonalds started serving breakfast all day, you could only get a breakfast sandwich before 10:30 am. Sometimes I want breakfast food for supper. Pancakes, bacon and biscuits, omelets, and even waffles sometimes. This really isn’t even a recipe, it’s more like an explanation of how to put simple ingredients together and make a quick meal. It’s like a sandwich but makes you feel like you actually cooked. Egg Bagels are easy enough to make that you can ditch the frozen variety. If you want a frozen breakfast sandwich, why not just make your own and freeze them. I go ahead and use all 6 bagels from the bag and freeze mine. This is my version of meal-prep! Sometimes, I even have loaded mashed potato bites in the freezer and will heat a few of those up to go with our meal-prep egg bagel sandwiches. If not, I probably have some frozen hash brown patties in the freezer. Just because we are food bloggers doesn’t mean we cook ALL the time. Don’t judge. These can be made with English muffins as well, but I think that the bagels hold up better. Sausage, bacon, or any other meat can also be used. You could even omit the meat altogether, or the egg, and even the cheese. But, if you take enough stuff off of the bagel, you might as well just toast it and cover it with butter or cream cheese. Toasted buttered bagels are also good covered with homemade honey peanut butter. Many “midnight” snacks have taken this form over the years at my house. Simple really is my style. If freezing, do not add cheese until the eggs have cooled. Place individual egg bagel sandwiches in small freezer baggies, then place baggies into a large freezer baggie to prevent freezer burn. To reheat from frozen, wrap each egg bagel sandwich in a paper towel and microwave at 50% power for 90 seconds, then an additional full power for 30 seconds. Check center of sandwich and add an additional 15 seconds if necessary. To reheat egg bagels from the refrigerator, wrap in paper towel and heat in microwave for 45 seconds. Check center and re-heat in 30 seconds increments until the desired center temperature is reached. 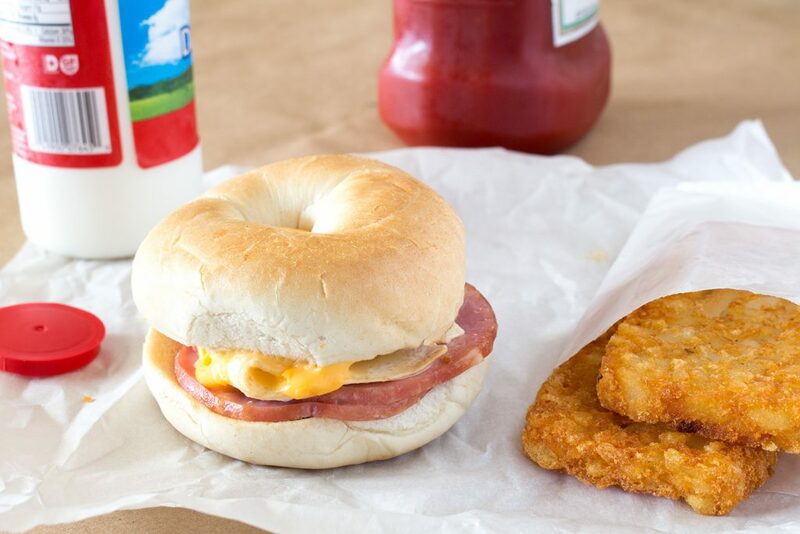 Egg Bagel Sandwich is great for grab and go breakfasts. 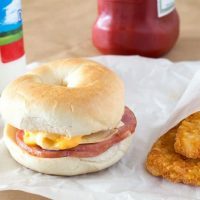 Toasted bagels with Canadian bacon, egg and cheese is perfect as a make ahead quick breakfast or dinner. Just re-heat in the microwave and have a meal in under a minute. Split bagel and toast to a light to medium brown. Set aside. In a small skillet, melt butter over medium high heat. Warm Canadian bacon in skillet and place on one side of toasted bagel. In the same skillet, add the egg. Break the yolk and fry until the egg can be flipped. Carefully flip the egg and finish cooking the egg. Place cooked egg on top of the Canadian bacon. Immediately top with cheese slice. I usually tear the cheese in half and crisscross it over the top. Top with remaining bagel half. Place in microwave and cook on high for 15 to 30 seconds, or until cheese just starts to melt. 2 slices of cooked bacon, 1 cooked sausage patty, or any other meat can be substituted. American cheese can be substituted with any cheese of your choosing. Use different combination of meats and cheese to suit you needs. If freezing, do not microwave. Do not add cheese until the eggs have cooled. Place individual sandwiches in small freezer baggies, then place baggies into a large freezer baggies to prevent freezer burn. Microwave at 50% power for 90 seconds, then an additional full power for 30 seconds. Check center of sandwich and add additional time at 15 seconds. Nutritional data uses 1 standard bagel with 270 calories, and 1 ounce Canadian bacon. Bagels vary widely by nutritional content, as does Canadian bacon slices, please adjust accordingly.